The Perfectly Simple Pizza Salad. Salad Recipe Series. 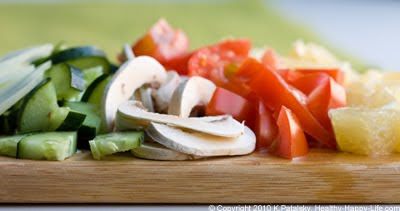 My Perfectly Simple Pizza Salad isn't just a side dish recipe - it's a necessary component to pizza night. 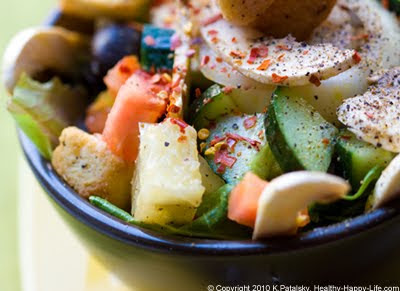 I crave this salad with my pizza pie! And it's super simple to prepare, so it grants your "easy dinner" wishes: Phone in order, prep your salad, grab some bevies - done! The Best Friday Night. There's nothing better than a Friday night at home snuggling with your family, watching a good movie and ordering a pizza from your favorite neighborhood pizza guru. If you're vegan and lucky, you've found a pizza joint that humbly makes you a delicious cheese-free pie loaded with fresh veggies, maybe even some Daiya vegan cheese melted on top. Pizza Salad. 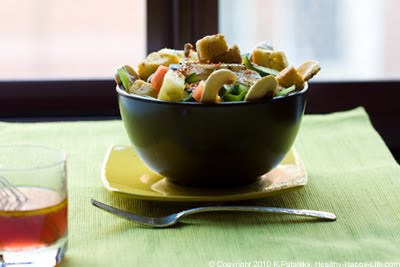 Every perfect pizza deserves a perfect pizza salad: crunchy chopped veggies over fluffy fresh greens, all marinating in a zesty-sweet vinaigrette dressing with a heavy handed dose of fresh black pepper on top. Stick your delivered pizza in a warm oven, because this salad is going to attract your forks' attention for a while. Get my recipe and find out my fave pizza toppings..
My fave pizza toppings: kalamata olives, spinach, artichoke hearts, roasted red peppers, fresh basil, roasted garlic, capers, red onions, hemp seeds (if available), thin lemon slices, broccoli and tons of mushrooms - preferably the exotic kind. No I don't get all these toppings on the same pizza! I like to change it up once in a while. And I'm not really into the 'veg meat' pizza toppings. My whole life I've been ordering veggie pizzas with no cheese, and I've really grown attached to them. Give me some chewy crisp crust, a perfectly herbed and zesty san marzano tomato pizza sauce, pile on the veggie toppings and I am in pizza heaven. Whole wheat or spelt crust is also a nice touch. And yes, I will go for the Daiya vegan cheese once in a while. 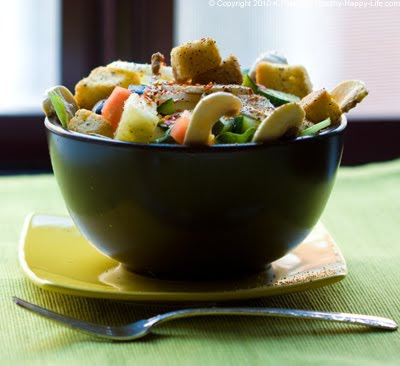 Don't Pay for a "House Salad" - Make it at Home. Why pay $5-$10+ for a House Salad when you can easily make an amazing, fresh, made-with-love pizza salad in your own kitchen, and in just a few minutes. Your "house salad" will soon become a pizza night favorite. And shaving a few bucks off your delivery bill will feel good. *arugula, spinach, romaine, baby greens, etc. 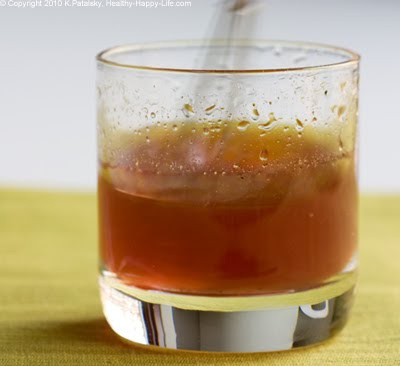 note: you can also use balsamic vinegar instead of red wine vinegar, if you'd like. 1. 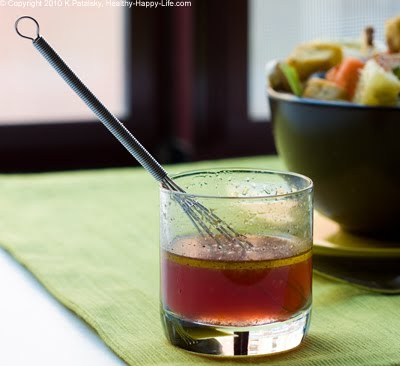 Prepare your dressing by whisking together ingredients, set aside. 2. 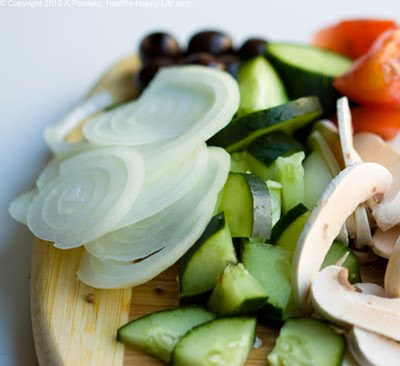 Prep your veggie ingredients: chop the cucumber, dice the tomato, slice the mushrooms, dice the citrus, slice the onions and slice your olives. 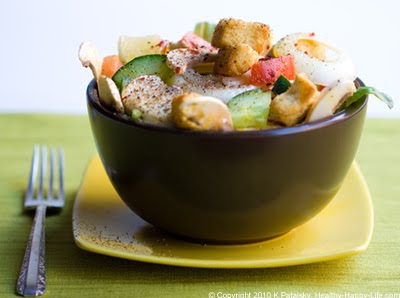 Place all these veggies in a large mixing bowl. 3. 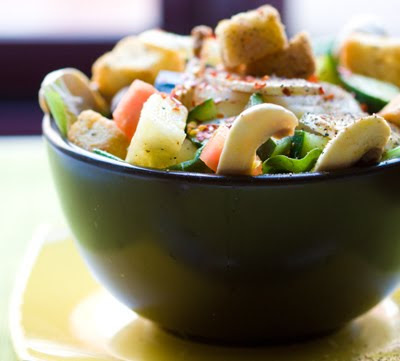 Add a drizzle of red wine vinegar and a drizzle of EVOO to your chopped veggies bowl. Grind in a plentiful amount of fresh black pepper. Toss gently. Set aside. 4. Gather your salad bowls and your greens. Divide the greens between the bowls. Leave room for the veggies though! Drizzle a small amount of dressing over the greens. 5. Spoon a plentiful amount of your veggies mix on top of the greens. 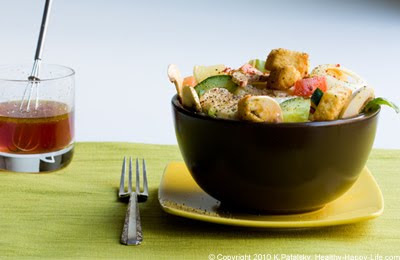 Pour the leftover veggie mix into a small bowl for easy veg refills. 6. 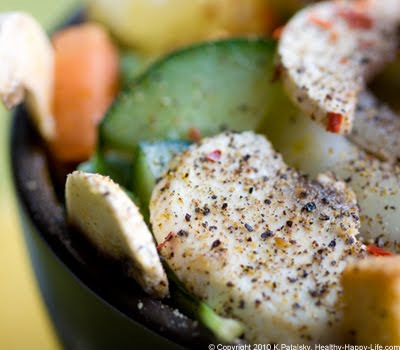 Add another drizzle of dressing over top and cover the veggies in fresh black pepper. Add 1 tsp of red pepper flakes to each salad as well. 7. 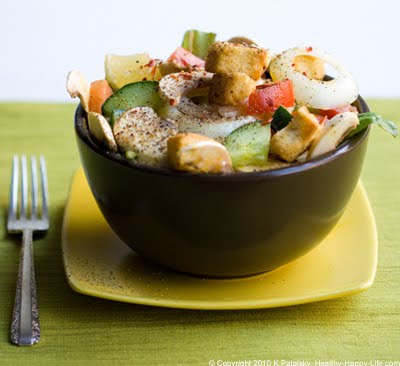 Dot salads with croutons and serve!